Pariplay specialise in online instant win, scratch and other fixed odds casino games. Using the latest software their games are easy to get started with and fun to play thanks to excellent graphics. 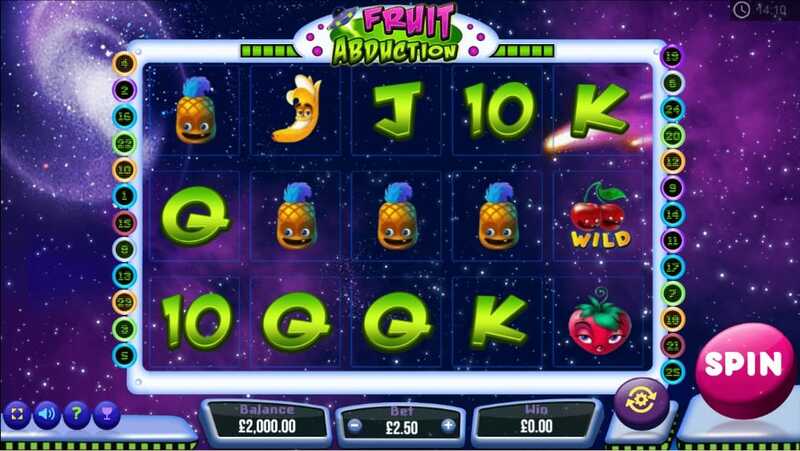 Get involved in an intergalactic space mission with Fruit Abduction, a really fun online slot from Pariplay that is full of humour, bonus features and big, big, prizes. It’s a modern set up with sleek transparent reels and a gaping cosmos background, complete with wormholes and flying saucers, for a really classy backdrop to the game. You’ll find 5 reels and 25 paylines in Fruit Abduction, with this in mind it’s your job to select how much you want to commit to your wager. Just use the plus and minus buttons under the reel to select the amount. At this point you can choose to turbo charge your game by selecting the autoplay mode for a faster gaming experience. Get the reels spinning and then you’re on the lookout for matching symbols lining up and getting you wins. It’s a fairly simple paytable that comes into play with Fruit Abduction but the rewards are good. The classic casino cards will get you a win between 4 and 100 credits, while the fruity banana, pineapple, strawberry and orange will bring you a max reward of 1,000. Cherries: The cherries are the wilds for Fruit Abduction. These handy fruits can replace all the other basic symbols in the game and help your reach winning combinations. If you’re really lucky you might land a Cherry combination which will bag you a big x5,000 win. Tiny scatter: This symbol is another really useful one in Fruit Abduction, as it will can trigger a win no matter where it lands on the reels. If you land three or more on the reels at the same time this fruity little number can pay up to 30x your total bet. Bonus symbol: The little tree planet is the bonus symbol for Fruit Abduction and a symbol you’ll want to keep an eye on. If you can line up 3 or more of them on a payline you’ll get yourself an intergalactic mini-game. In this mini-game you can get the chance to multiply your total wager time and time again. This cool little game is nice modern take on the old school fruit machines that we know and love. Fruit Abduction is an intergalactic experience with cosmic graphics, effortless and smooth gameplay and lots of humour. It’s a great online slot with big prizes perfect for novices and expert players alike.